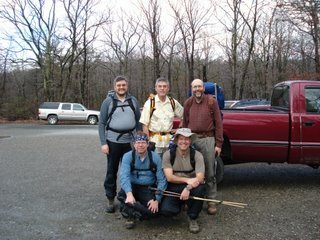 Joel, W2TQ, and myself arrived at the Mt. Everett, MA Ranger Station about 11am, Dec 1st. About an inch of light snow had fallen that morning creating some slippery roads but coating everything with a creamy-white finish. The blue clouds were cruising fast across the sky creating dashing pockets of sunlight on the new snow. We started our hike from the parking lot, our car safely protected by the proximity to the Ranger Station. It was becoming noticeably colder after the frontal passage with temperatures around 20 f. and very windy. You could hear the wind in the tree tops higher up the mountain as we turned onto the now-closed and gated road to the top of Mt. Everett. This is a very scenic hike and a very crowded area in the summer due to its accessibility. After a mile we came to Guilder Pond, frozen over but pretty with its deep winter coat of ice and snow. Midway up the summit road we spot some curious paw tracks in the snow heading in our same direction. They were too big for a coyote or even a wild dog and had the tell-tale large palm pad, finger pads, and the give-away claw marks in the white snow. It was a small black bear with the palm pad only about 3 inches across. It was late in the season and I’m sure the bear was looking for its winter hibernation nest. After a climb of about 1000’ we get to the top. The temperature was now near 10 f. and the wind ferocious at speeds around 40 mph, biting at our exposed skin with every gust. It was now clear and sunny and we hike the final 500’ of the icy trail to the summit, billowed by the gusty winds. We take some pictures of the 360-deg view of the southern Adirondacks to the north, the Catskills to the west and the beautiful valleys of the Berkshires to the east. No need to linger here; much too cold for any ones comfort. The Appalachian Trail crosses over the top of Mt. Everett and there is a small, stone shelter at what was once a vista parking lot years ago when cars were allowed up the access road. 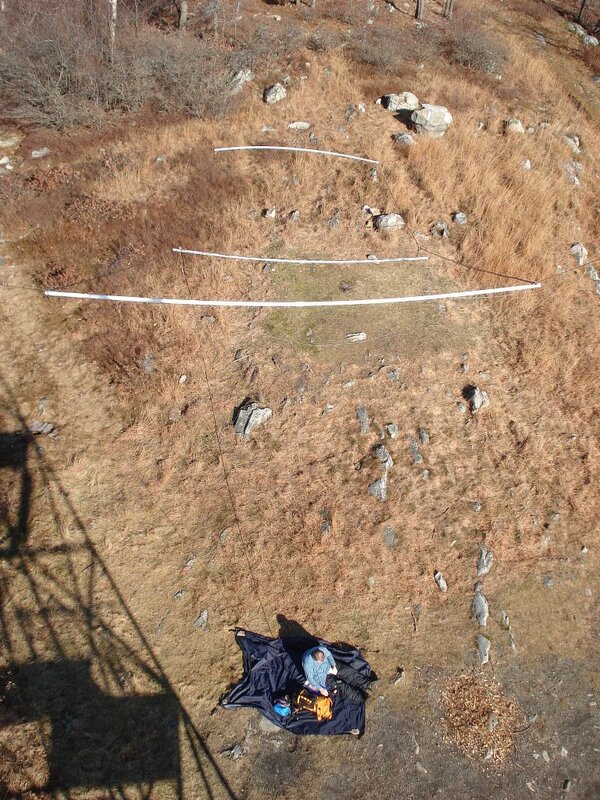 In the late 1990’s, the 2nd steel firetower was removed but the cement footings are still embedded. The footing remains of the 1st firetower constructed in the early 1900’s are still visible if you wander around a bit. 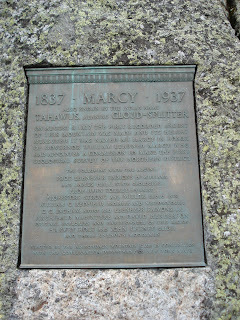 The first picture was of the original Park sign from the early 1900’s captured when I was here in the summer of 2005. That sign has now been replaced by a sign antiseptic in comparison. We huddled inside the stone shelter to escape the wind and silently marveled at the vista to the east and the 1,500 foot dropoff to the Berkshire valley below. The adventurer in me was thinking this would be a great place to view the morning sunrise….but then another wind gust rocked me to reality. Joel consulted his maps and we wisely hiked north to a lower elevation on the AT to several shelters. The first was one of the best shelters I’ve seen o n the AT with water nearby, a fire pit, privy, bunk beds, a loft, everything but a heater! We dropped our packs, quickly scouted the other nearby shelter and readily agreed we wouldn’t find anything better than this 5-star wilderness hotel! The temperature was now 10 f. The wind is still howling up above but we were somewhat protected in the forest below. We scavenged for firewood and I quickly got a small fire going. The world (well, the camp) seems a much better place with the crackling fire fending off the worst deep chills. We could tell it was to be really cold overnight; the forecasts were for the low single digits. What about my planned QRP operation with my Elecraft K1 and my trusty dipole to string in the trees? It seemed like an extravaganza….we were cold, it was supposed to get colder, the fire’s heat sucked up the wind and I wanted to put up a dipole in the trees? My coax was frozen stiff, the 50-lb nylon fishing line I use to anchor the dipole ends was brittle, every effort demanded twice the concentration. But I got the antenna up with Joel’s help, I plug my lithium Ion battery pack in, connect the coax and now for the moment of truth….does a K1 work at single digit temperatures? I tentatively push the on button….YES! I hear 40 cw! It was around 4 pm, getting colder as dusk settles into our camp area. I called CQ for about 30 minutes but no answers. Was something wrong? Maybe I’m too early on the band? I check the system and decide that it is just too cold….maybe the RF is freezing I laughingly rationalize. I abandon my ham radio efforts to focus on getting warm, preparing for dinner of some freeze dried Jamaican Chicken, and then into the down sleeping bag. Dinner was wonderful! And in spite of an occasionally snow flurry, by 7 pm or so the numbing coldness drives us into our sleeping bags for warmth. Surprisingly we fall asleep quickly and I vow I’m not getting out of my warm bag to visit the privy during the night. We’re nearing the winter solstice so it didn’t get light until around 7 am. I wanted to try to operate on my favorite 40m band but I didn’t want to get out of the warm sleeping bag. I squirmed around to get the K1 set up so I can kind of operate from the bag. I connect with W9ZN who has a really loud signal into New England. My second contact was with WB2YRL in Virginia who reminds me that a snow storm is forecasted for our area later that day. The temperature is now 5 f. and I’m surprised my K1 works at this temperature. We eat a great breakfast (ok…as “great” as oatmeal can be!) and it starts to lightly snow. We think we should get on the road back to NNJ before the weather snarls traffic. So we quickly pack up and hike back to the car, and start our 2-1/2 hour drive back. It was a great winter camping trip but temperatures in the low single digits make everything much harder. It’s surprising how cold your bare hands can get in just a few minutes and how challenging it is to stay warm. Therein lies both the beauty and beast! Thanks to my Polar Bear friends who were dutifully listening for my wilderness signal. And I can hardly wait to the next winter outing…. Of course that’s easy to say now in the comfort of my easy chair and 70 f. shack temperatures! My work-related conference in Las Vagas was over about 2pm on Friday, Oct 12th. I took a quick shuttle ride to the airport to pick up a rental car then head NE on I-15 out of Vegas. With the speed limits at 75 mph (and nearly all traffic moving at 85 mph), in two hours I quickly reached St. George, UT, my planned overnight stop. Early Saturday, I drove the next hour into Zion National Park. After parking at the South Entrance, I jumped on the Park Shuttle for a ride to the starting point for the 4 mile, 2000’ climb to Observation Point at an elevation of 6,800’. Observation Point is considered by the locals to be the one of the premier vistas in the Park. The other is Angel’s Landing. Zion Park is an unbelievable place. The Red Rock walls jut straight up for 2000 feet or more. And unlike the Grand Canyon where you view everything down from the rim, in Zion you are at the bottom looking up…constantly. And the rock cliffs are varied in colors from a pure white to a dark red. And some are horizontally striated with the different colored rock layers deposited eons ago. My climb began about 8:30am. It was 40’s cool and the morning sun had not hit the climb path which is carved out of the rock walls in many places. The views were absolutely breathtaking (literally) as the constant climb to the rim top began. For the most part, the climb path was smooth and very easy to negotiate. The park maps say there are 27 switch backs on the way up as you meandered through canyons then up along the canyon wall to another switch back. And the view….words can’t describe and the attached pictures tell only part of the emotion as you walk up through the eons of sedimentary rock laid down 80-100 million years ago then uplifting began by the Pacific tectonic plate which started some 40 million years ago. The Virgin River created the canyons and continues to slowly carve out new landscapes. I hiked in with my K1 and dipole antenna. I was looking for the “just right” tree to string an antenna and make a few 20m contacts from the “top of Zion park!” Unfortunately, I had to hike a bit off the main trail on the canyon rim at 7,000’ to find a Ponderosa tree that would work. Twenty minutes later with the dipole up about 20’, I leaned up against the tree and tuned in 14.060 only to find the PA QSO Party and the FISTS guys going gang-busters! I made a few PA QP contacts then went down to 14.030 to call CQ. I got KF5LC from Texas and we had a long chat. It’s always great fun to tell people where you are and listen to their amazement! It was starting to get hot and I wanted to get back so I could drive the 3 hours to a town near the North Rim of the Grand Canyon, my Sunday planned area to visit. I quickly hiked out to the shuttle then to my parked car and then the drive out through the East entrance of the Park. What an amazing drive and spectacular views including the half-mile tunnel climb up to the rim and then east. I drove the 160 miles into Jacobs Lake in northern Arizona, arriving about 8 pm. Fortunately I got the last room at the Lodge, had dinner, and then crashed for the night. I wanted to get up early and catch the 6:15 am sunrise at the Point Imperial Overlook of the canyon. This is a drive up to an overlook at 8,900’ with vistas south and east of the Grand Canyon from the north rim. I left at 5 am for the 45 minute night drive. It was in the low 30’s and there was a 20 mph north wind. Cold but crystal clear and the sunrise on the canyon walls was spectacular as the different colored rocks lit up like fireworks as the first light hit them. This would be a great site to have some QRP fun but I was 5 hrs from Las Vegas. Since my planned departure was 3:30pm, I left the North Rim about 8:30 am after a few short hikes in the area. Every little town is a speed trap and I had a few close calls but got back to Vegas in plenty of time. I’d certainly recommend this area regardless of your hiking ability. 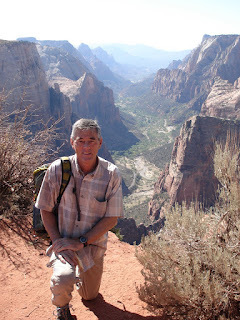 Zion is incredible and I go back there in a minute particularly at this time of the year when it’s not too hot. Also many folks I spoke with also recommended highly Bryce Canyon Park as having some great hiking with incredible beauty. Another day….. I made it back after a 5 hr traffic-congested drive home from the High Peaks area of the Adirondacks in upstate NY. Overall, what a great trip! My friend and hiking buddy, Ed, WA3WSJ, met me in Keene, NY which is the jump off for the Johns Brook hike-in Lodge and trail to Mt Marcy. It rained heavily Thursday and later that evening. I met Ed about 11 am Friday at the Trails Inn B&B and we had our "last lunch" in the local village. By 1 am we were on the trail up to the hike-in Johns Brook Lodge. What a great place! There were several family groups there (one of about 8 or 9 guys) who come up every year to hike. I was able to get a dipole in the trees and made several contacts on 20m with my Elecraft K1...one with an 88 yr old in Fl (KJ4DU) who grew up in this area! 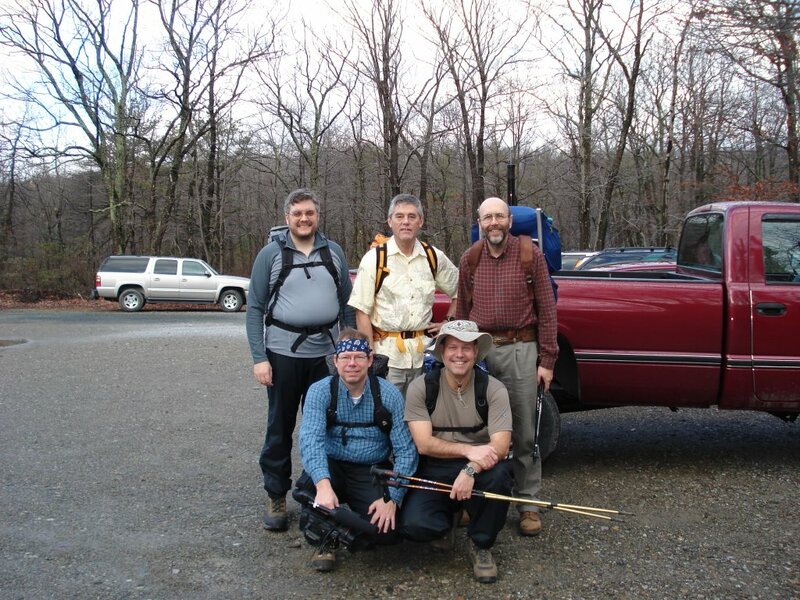 We had a long qso...he had hiked "many times" the area we were in! I tried 30m but then the evening rain showers started up and really didn't quit until the next morning. Around 7am on Saturday I tried 30m but the band was dead. I called CQ for about 15 mins but the band was really dead. So Ed and I left around 8 am and started the 3000' and 5.4 mile climb to Mt Marcy. After two miles you start "The Ascent" which is like climbing up a creek bed....all wet boulders and like a stream because of the recent heavy rains. We intended to stay at a lean-to just before The Ascent but it was torn down. The plan was to leave a bunch of gear at the lean-to but we had to forge on with full packs. The sun was peaking in-and-out of the morning clouds but the wind was howling higher up on the mountain. After 4 hours, we got to the trailhead for the remaining 0.6 miles to the top. Ed was behind me a bit, negotiating the rock climb much more carefully than I. Water everywhere. It had really rained hard the last few days and deep puddles made hiking the trail difficult. The last 0.6 miles to the top is above tree line...just rock and very exposed. The wind was steady at 30 mph and gusting much higher. And cold since theclouds kept the top socked in. Occasionally the clouds would part and you would get a great view of the mountainous area. Really magnificient vistas. The temp was in the 40's but the wind chill made it miserable. I was in gloves and hooded jacket. I still entertained using the Jackite fibreglass pole and stringing up my dipole but when I got to the top the wind was way too much and by then I was really cold. So I snapped a few pictures when the clouds parted then headed back down the exposed rock mountain top to find Ed. I met him about half-way up and when I told him the conditions, he wisely turned around. Now it was around 3 pm and we hadn't seen any possible camping spots. So the only alternative was a 3.4 mi hike down to a shelter we had passed on the way up. Rocks, rocks, and more slippery rocks. Ed now hates rocks, especially slippery rocks! Did I say that Edhates rocks? We got to the shelter around 5:30 and were really tired. I was going to throw the dipole in the trees but 3 really friendly Canadian guys from the Ontario area showed up and we got talking and before long it was dark. We ate and were in the sleeping bags by 8 pm. Overnight temps were in the 30's...but everyone was toasty. Bears are a real problem up there so you must have a "bear cannister" to protect your food, garbage, toothpaste, etc. Anything that would attract a bear goes in the bear cannister can. We didn't have one but the Canadian guys had space in theirs so it all worked out. Apparently the Rangers will fine you if you don't have one in your camp. The next morning (Sunday) around 8 am I strung up a 30m dipole in the trees but the bands were really dead. I didn't hear anything, even on 40m. So not much of a dx-pedition. I think to work the close in Polar Bears, I'm gonna have to try a NVIS type antenna. The previous night there was a pipeline into Fl, Al, Tx and the other southern states and while driving up early Fri am, I worked a bunch of guys in Mi, Wi, and Illinois with the IC706 and a screwdriver vertical off the pickup. So that's the short story. A great adventure and I really enjoyed the country. Lots of Canadians come down for the mountain hikes and vistas. I started out around 1 pm, a little late, but given the estimated 2.8 miles into the site, I thought I could make it in time for at least 3 hours of operating. But.....the trail started on the northside of a hill, shadowed from any warming sun. Within a 1/4 mile I had a foot of slushy snow, slipping and slideing with every step. There's got to be a better trail I thought.....which I found after I backtracked but the new trail added a lot more to my trek.... like another 6 miles I figured out later. I made it to the abandoned Fire Tower atop South Beacon Mtn at 1600' ASL. The view was amazing of Hudson both North and South. You could even see the distant outline of NYC buildings. But it was 4 pm. It would take me about 30 to 45 mins to set up my rig and hang an antenna off the Fire Tower. I was concerned about the trail back in the snow since I now had no time to go back the long way. Common sense being the better part of bravery, I choose not to set up and activate this site, being concerned about getting back to the parking lot before dark. I'll save South Beacon Mtn for another day when I can get there in plenty of time and spend at least 3 or 4 hours operating. So I'll chalk this one up to a "conditioning hike." Friday night we had about 2 to 3” of snow and Saturday started with temps in the low 20’s. Temps dropped during the daytime and the wind picked up from the northwest. The weather report was calling for temps in the teens, and wind gusts of 15 to 25 mph. I was planning to go up to my nearby BearFort firetower which is on a ridgetop and very exposed and therefore windy. I was planning to take a tent for protection from the wind. The one-lane road into the Firetower parking area was snow covered thereby requiring 4-WD. I parked at the gate and started the 30-min and 400’ elevation climb into site. It was very pretty with the trees snow covered but you could hear the wind in the tree tops so it was “going to be fun” at the top! Fortunately the sun was shining which took the chill off the skin, at least for now. I last was here for the Flight of the Bumblebees QRP contest in July when the temps were in the high 90’s! What a contrast! In the past, I’ve hung my multi-band dipole off this tower numerous times; in fact, I have a plastic pulley tied to one of the yardarms so I can install one end of the dipole rope once and not have to climb the tower after dark to un-install….I just pull the rope thru the pulley from the ground. The tower climb was very challenging…the wind was gusting to at least 25 mph or higher. The cold temps made each “artic” blast very painful on exposed skin. I finally got the rope installed only to watch my tent start “rolling” down the ridge to a cliff during one of the larger gusts! Oh man!! Here I was at the top of the tower watching this happen in slow motion and helpless to stop it. All I could do was laugh…the timing couldn’t have been better! So I carefully climb down the tower, walk over to the icy rock cliff edge, apprehensively peer over the cliff.... Yes, there’s my tent, far, far below, somewhat in a tree top! Ok, how am I going to retrieve it? Well, I ended up hiking down the trail and crossing over to the bottom of the cliff and then hiking back to where my tent is about 10’ off the ground in this “kite eating tree” ala the Charlie Brown cartoons. I find a stick and dislocate it, semi-pack it up, head back to the top and start reassembling. The ground is so frozen that tent stakes won’t work; I end up using big rocks to anchor the windward edges. Now it’s about 3 pm and the temp is around 15-degs as the sun is setting lower. I get the dipole up in the air, connect the coax which creaks with every movement, crawl into the tent, and connect everything up to the K1. My lithium battery is inside my coat to keep it happy. But 40m, my favorite QRP band, is wall-to-wall RTTY stations. I make a quick contact with the Hell guys, N8H, listen a bit for WA8REI who always seems to be everywhere but don’t hear Polar Bear Ken. I tune down to 7020 but it’s jammed with 40-over-9 FOC stations. I tune back and hear Ken! I give him a call, we commiserate on how miserably cold it is before the RTTY guys beat us up. Good contact again with Polar Bear Ken. Ok, now what? I have to get back outside to lower my dipole to switch it over to 30m. Now it’s 4 pm and the temp is now around 12-degs, the winds blowing harder. I make a contact on 30m but the “thrill is gone.” It’s too cold. Around 5 pm the sunset and the temps seemed to plummet. It was certainly under 10-degs and the wind was still blowing steadily at 15 to 20 mph with gusts much higher. I figure I better get out of here before I lose all light. I quickly packup, stuffing everything into the backpack. Fortunately I’m dressed warmly so any activity kept me very warm. As soon as I got off the ridge, the wind died down and it was kind of pleasant…..for temps around 10-degs! The weather was quite warm, almost balmy, for early January with temps in the mid-60’s. The forecast was for partly cloudy skies on Saturday with temps again in the 60’s. Much too warm for a bunch of Polar Bears!! We started our hike up to the Catfish Fire Tower around 10 am on Saturday. 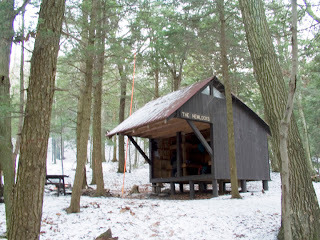 It was about 1-1/2 miles with about a 300-400 ft elevation gain from the Mohican Outdoor Center (MOC) and our large, very comfortable “in-da-den” cabin. There were about 8 of us that hiked, spread out into two groups. The bottom portion of the trail was water-sogged due to recent rains and we navigated from rock stepping stone to the next for 200 yds or so. Before long we were at the top of the ridge overlooking the valley to the east. We were with Glen, NK1N, who was periodically videotaping this trip and later would produce a DVD of this Polar Bear outing. We hiked north for another mile to the Catfish Firetower. It’s at a grand location with views east and west and 360-deg vistas from the cabin of the firetower located about 60’ above ground. I quickly assembled the W7EL FD two-element 20m phased beam made of ladderline amidst a lot of discussion among other Polar Bears. It’s a gain antenna, transforming my 5 watts to a radiated power pointing west of about 30 watts (8 dbi of gain). One end was tied to the tower at 50’ and the other to a distant tree at 30’. The wind was increasing so the climb up the tower was “invigorating” to say the least. The weather was improving with temps nearing the high 60’s. If you were out of the westerly wind, it was almost hot! There were about four radio operations so everyone spread out along the ridge so as to not interfere with each other. At the Catfish site, there was a throng of day hikers constantly asking “what’s going on?” It’s always fun to talk about “Morse code and small radios” and generally people are always amazed and somewhat enthusiastic but it always takes away from actual operating time. However, I made a number of contacts with the best being AZ, CA, and Oregon. I even had a long QSO with an acquaintance in Oregon and it was fun to bring him up to date with my east coast activities. I broke from the activities and gave Glen a chance to plug in his KX1 and have some fun with the phased array. We had planned to hike down the ridge before the 4:30 sunset for safety reasons so I started disassembling the phased array about 3 pm. In 30 minutes I was packed up and ready to go. We were to pickup John, NU3E, on the way back since he was operating south of us a quarter-mile or so. But John was nowhere to be seen as we hiked thru that area. The consensus was that “he must have started down the hill.” Later, we would find out that we left him up there when John walked out about 45 minutes later. All in all, it was like a warm Spring day, not anything like a “normal” January outing! And a good time was had by all the Camp-Run-a-MOC attendees!